A selection of Bespoke Aquamarine and diamond rings in various shades of blue. 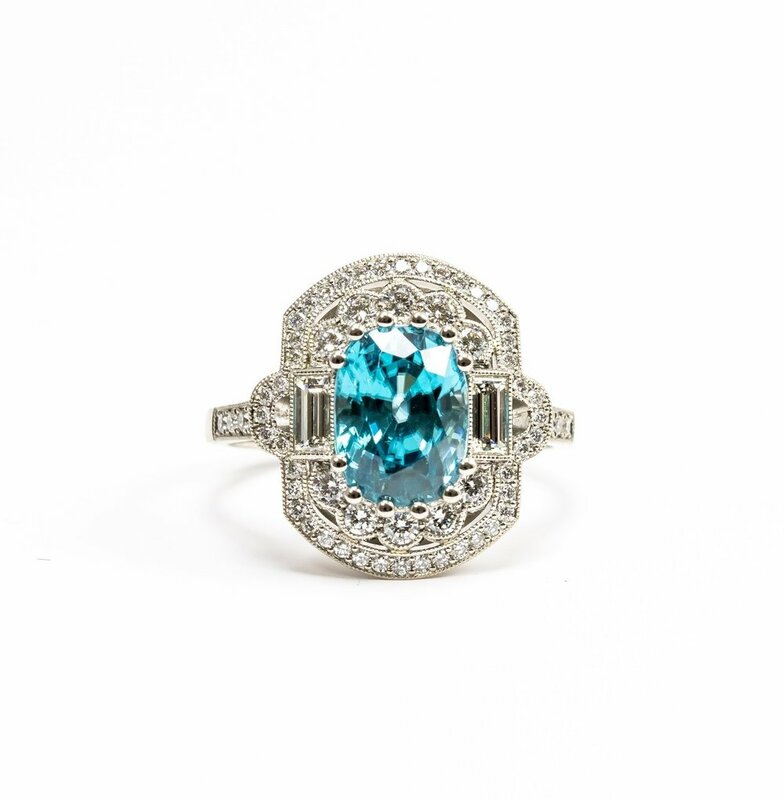 Aquamarine and diamond Art deco style ring. Made in Chichester, england. Diamond and blue Zircon art deco style cluster ring. Made in Chichester, England. Cushion cut aquamarine and diamond cluster ring. Aquamarine and diamond ring with hand engraved shoulder decoration. Made in Chichester, England. 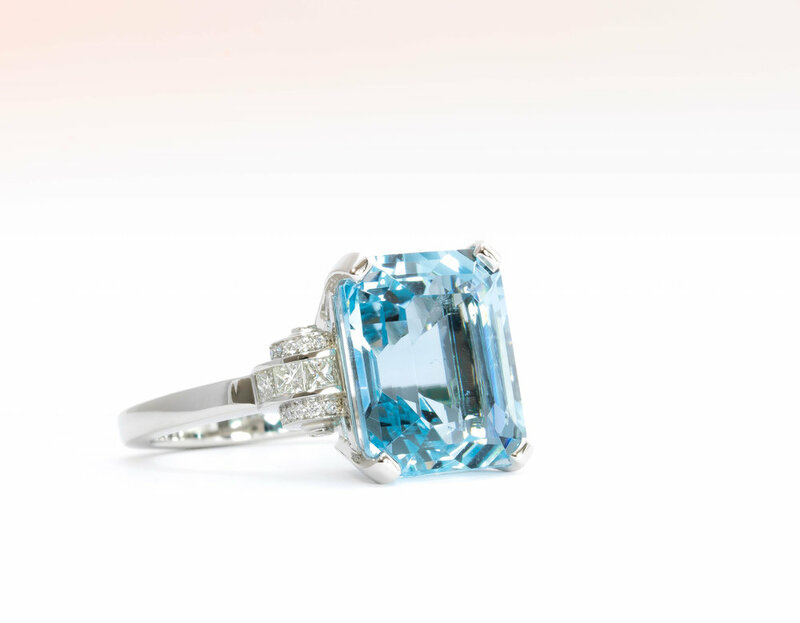 Aquamarine and stepped baguette diamond shoulder ring. Made in Chichester, England. Platinum mounted Aquamarine and diamond entwined band ring. Made in Chichester, England. Aquamarine and diamond cluster ring made for a London jeweller. Made in Chichester, England. 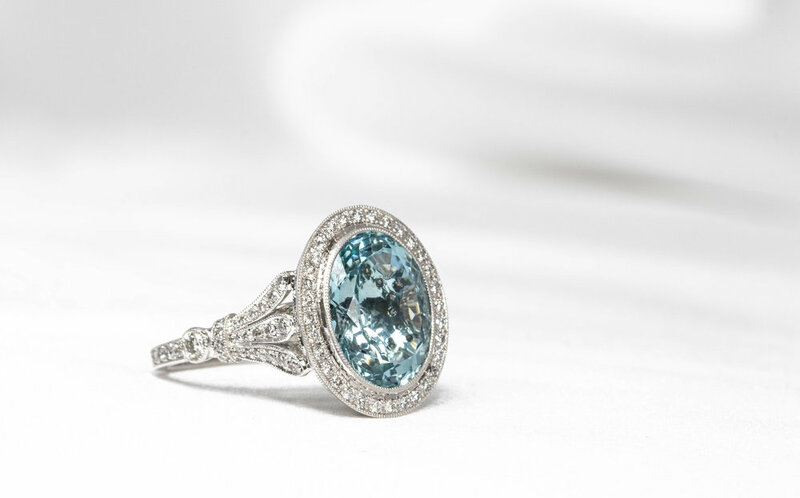 Blue Zircon, baguette and round diamond set ring. made in Chichester, England. Mint aquamarine and diamond octagonal cluster ring. Made in Chichester, England. Platinum mounted pear shaped blue zircon and diamond cluster ring. Made in Chichester, England. Pear shaped aquamarine and diamond cluster ring. Made in Chichester, England. Aquamarine and grain set diamond Art Deco style stepped ring. Made in Chichester, England. Emerald cut aquamarine with trefoil diamond set shoulders. Made in Chichester, England. Platinum mounted early C20th style aquamarine and diamond oval cluster ring. Made in Chichester, England. Beautiful and finely worked, diamond set scroll design underbezel from the oval cluster shown above. Made in Chichester, England. Oval aquamarine with diamond set fine scrollwork shoulders. Made in Chichester, England. Belle Epoque style aquamarine and diamond set pendant. Made in Chichester, England. Bespoke Zircon and diamond platinum ring made with customers 5.02ct blue zircon. Made in Chichester, England.